Months before the declaration of war, leaders in business and Government were fully aware that stringent action would have to be taken to prevent a run-away inflation. There was, however, no general agreement about the kind of action which should be taken. The big farm organizations opposed control of farm prices; labor resisted wage controls in the face of rising profits and living costs; and manufacturers were alarmed by the prospect of heavier taxes. The public wanted the Government to hold down the cost of living, but there was little realization that inflation controls would require the sacrifice of immediate financial gains for the more lasting benefits of a stable economy. These attitudes were prevalent in the period January-October 1942, when the Government was trying to work out its inflation-control program. salaries, and income payments by about one-fifth. These increases were stimulated in large part by the European war and by our own war expenditures which, in December 1941, amounted to $2 billion. Chart 27. Consumer's Price Index. and would increase consumer demand for scarce goods and services. 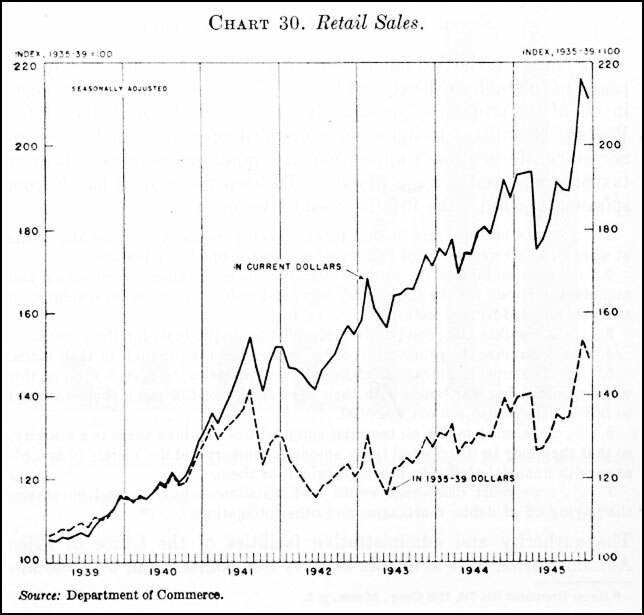 Expressed in terms of dollars, consumer demand in 1942 would exceed available supply by about $17 billion. The resulting pressure on price levels would be tremendous and would have to be controlled in some fashion if we were to maintain a stable economy. There were two general approaches to the problem of economic stabilization. The first, proposed and strongly advocated by Bernard Baruch, required imposition of a general ceiling on "prices, rents, wages, commission fees, interest rates"--in short, on the "price of every item of commerce or service." The chief advantage of this method was the comprehensive nature of the control. Each citizen would be "treated alike as part of one nation joined in a great emergency and every segment of our economy, agriculture, labor, business" would be treated "as parts of a single, living sensitive organism." The quality of sacrifice implicit in this plan might be expected to gain acceptance, if not active support, from powerful farm, labor and industrial organizations which normally were suspicious of each other and of Government regulation. An essential condition of the Baruch plan was that the general ceiling be established on "some date on which the normal operations of the law of supply and demand can be said to have controlled prices," before factors such as material and labor shortages had distorted "normal" price relationships. If this were done, it would be necessary only to adjust prices which, for one reason or another, were not at satisfactory levels on the base date. Ideally, a general ceiling should have been issued early in 1941, coincident with the development of priorities machinery for dividing up supplies of scarce raw materials. It is doubtful whether such action would have been supported by a nation generally unaware of the impact which the European war would have on our own economy. If a general ceiling were established in 1942, it would have been necessary to freeze prices at levels prevailing in 1941. The facilities required to administer the "price roll-back" implied in such action had not been established when war was declared and later experience showed that is practically impossible to effect a roll-back. short-of-war" period, when stable prices depended on cooperation between Government and business. Commodity price controls, in practice, could not prevent increases in the cost of living as long as consumer purchasing power exceeded the available supply of goods. It was necessary, therefore, to supplement price control with other anti-inflation devices--wage stabilization, "a considerable increase in taxation, a decided stepping up of the savings program, and a reduction in installment credit. "1 Failure to deal vigorously and effectively with any one of these related problems would handicap effective action on the others. Failure to tax excess profits or stabilize living costs or control wages would be the signal for powerful pressure groups to seek special benefits which were incompatible with national objectives and probably injurious to their own ultimate welfare. The influence of these groups in Congress would make legislative approval of rigorous anti-inflation measures more difficult to obtain. Finally, the operations of various Government agencies entrusted with separate phases of economic stabilization would have to be related to a coherent stabilization policy and perhaps tied together through common administrative direction. Whichever method of stabilization was chosen, the technical problems were formidable. In July 1941, however when there was still doubt about the public's willingness to accept stringent economic regulation, the selective method of control seemed especially attractive. Price-control officials frequently stated that selective controls would not do the whole job and that supplementary actions would have to follow, such as wage and credit controls and heavier taxes. But OPA's limited experience seemed to indicate that price ceilings extended to wide range of commodities would go a long way toward holding down the cost of living. Probably with this limited objective in mind, a bill embodying the principles of selective price control was submitted to Congress on july 30l, 1941, and, after 3 months of investigation and discussion, wsa passed by the House of Representatives shortly before the Japanese attack. At this point, the bill, which, after all, had been shaped months before the declaration of war, might have been reexamined to see whether it would meet the requirements of a war economy. Events pressed in another direction. With the President fully occupied by military matters and OPA officials thrown into a series of actions directed against a wave of speculative price increases, it is not surprising that the situation was not reappraised and that a drive for immediate enactment of the pending bill began in the Senate. By the end of January the Emergency Price Control Act of 1942 had been passed by Congress and signed by the President. After passage of the Price Control Act the character of economic stabilization problems shifted somewhat. During the period January-October 1942, with which this chapter is concerned, the chief problems were (1) to obtain legislative authorization for more effective control over the prices of agricultural commodities; (2) to formulate a stabilization policy which would encompass prices, wages, rents, and war finance; and (3) to establish the administrative facilities required to put the coordinated stablization program into effect. On December 9, 1941, Mr. Henderson presented to the Senate Committee on Banking and Currency the case for a strong price-control law. Legislation authorizing an expanded price-control program was deemed necessary as a step toward more general anti-inflation measures. The experience of "every nation at war," whether a "democracy or a totalitarian government," was adduced to show that economic stabilization was as essential to effective prosecution of the war as staffing the armed forces or providing material for war production. Principal issues developed by Congressional consideration of the price-control bill were whether wage stabilization would be included in the bill and be administered by the price-control agency, and whether agricultural products would be subject to the same controls and agricultural prices stabilized at the same levels as other commodities. of surpluses made it difficult to see clearly what policies should be pursued in dealing with short supplies. Although the outbreak of war was in itself a warning that planning for food as well as for industrial production should be reexamined, expert opinion continued in the belief that supplies of most agricultural commodities were more than ample for war needs. Former President Herbert Hoover, the Food Administrator of World War I, on December 16, said "the question of putting a ceiling higher than parity is more or less academic, because the Department with all its pushing up of the floor has not been able to get up to parity yet. "12 This view was shared by the Secretary of Agriculture. prevailing price levels.14 The American Farm Bureau Federation, however, was adamant on the 110-percent-of-parity limitation. It claimed that this restriction was necessary in order to prevent the average price of farm commodities from falling below parity and in support of its position it cited the Secretary of Agriculture, who had said, "The real purpose of restricting ceilings to a point somewhat above parity is to make it reasonably sure that all farmers will have an opportunity to get parity," and "It happens to be the expressed policy of COngress and the Administration to achieve and maintain farm prices at parity. "15 The fact that Mr. Henderson had give the 110-percent provision his approval was also noted. This difference of opinion between representatives of the Executive Branch on the question of agricultural prices undoubtedly weakened the Administration's effort to provide effective control of agricultural prices. On December 10, the day after Mr. Henderson urged the adoption of a strong price-control bill, the Office of Price Administration placed price ceilings on approximately all types of fats and oils. Many of these fats and oils were normally imported from the Pacific area. With the threat of Japanese blockade of these sources, a wave of speculative buying swept the market. The resultant sharp price increases called for immediate action. Since fats and oils are highly interchangeable, the Office of Price Administration had to put ceilings on both domestically produced and imported commodities. Under the theory of control incorporated in the pending price bill, it was necessary to fix prices as of a base date when a normal price relation between the various types of fats and oils existed.16 The prices set for cottonseed oil and lard were the closing exchange prices os of November 26, 1941. Mr. Henderson not only has failed to keep his agreement with regard to the 110 percent provision, but during the last few days he fixed prices on fats and oils without consulting the proper officials of the Department of Agriculture. If he is going to administer this program in this manner, I am not in favor of giving him this wide discretionary authority. I am not. Positively am not. On December 17, a resolution was introduced in the Senate requesting the Office of Price Administration to rescind its fats and oils order pending final action on the price-control bill. In spite of the fact that between August 1939 and December 1941 cottonseed oil prices had risen 137 percent and lard prices 76 percent, the Cotton Belt and Corn Belt Congressmen were bombarded by protests from their constituents.18 The President of the National Cotton Council was quoted on the floor of the Senate as stating that the action of OPA "constitutes a serious breach of good faith on the part of a Governmental agency. "19 Economic pressures and special interests did not become less active as the Japanese military machine moved into new areas of conquest. The possibility of delegating to the Secretary of Agriculture responsibility over agricultural prices was given serous consideration. Beginning with the National Defense Advisory Commission, authority over prices had been withheld from agencies responsible for production. This policy was based on the tendency of production agencies to become identified with the interests of producers. There were particularly strong reasons for placing price-control functions outside the Department of Agriculture. Over a long period of years the Department has sought to improve the economic position of farmers and to make rural life more attractive and satisfying. Its efforts to increase farm prices did not always accord with the desires of consumers and the food distribution trade, in whom it had only a secondary interest. These efforts, moreover, were supported in Congress by the "farm bloc" and by effectively organized farm pressure groups as well as by the Executive branch. Against this background, it seemed that a new price-control agency would be in a better position than the Department of Agriculture to hold down agricultural prices. This decision was acceptable to the Department until at appeared that demands would wipe out food surpluses and push prices above prevailing levels.
. . . If it is rightly used, the control of prices can help to get farm production. It can help prevent inflation . . . On the other hand, price management in wartime must be skillfully used and synchronized with the production effort. Otherwise it may interfere with the production effort and therefore do more harm than good. To take care of changing conditions, we have had to adjust prices of many products almost daily. It is a delicate and difficult job at best. What would it be like if another set of price controllers were to move into the field? The Department's operations in this intricate and important field should be complicated no more than they are at present. I must say that the Office of Price Administration has informed the Department that it will, if necessary change price ceilings. But this raises a question. The President was unable to stem the drive to divide control over the stabilization of farm prices. A provision requiring the Price Administrator to obtain prior approval of the Secretary of Agriculture of acton affecting agricultural commodities was passed by a 48 to 37 vote of the Senate.24 It was also accepted by the House. Because of fundamentally different attitudes, OPA and Agriculture frequently disagreed about control of food prices, with the result that stabilization and food-production policies required continuous adjustment throughout the war. One section of the bill which attracted relatively little attention at the time of the debates later assumed major significance. The bill submitted to the Congress contained a provision authorizing the use of subsidies for the purpose of obtaining maximum production or preventing price increases. It was contemplated that the Government would purchase commodities where necessary and resell at a lower price; a revolving fund was proposed in order to facilitate such buying and selling operations. The Price Control Act authorized subsidies for the purpose of bringing out marginal production but prohibited their use for preventing price increases.25 Under this authority supplies of copper, lead, zinc, and other strategic materials were expanded by payment of Government premiums on all production above quotas which generally were based on 1941 output. High-cost mines were brought into production without granting the price increases which they would have required to operate under OPA ceilings. This device, known as the premium price plan, stimulated increased production, helped to stabilize prices of metal products, and saved the Government millions of dollars on purchases of metal war matériel and in general proved to be one of the most successful of the wartime programs. and speculative price increases, price dislocations, and inflationary tendencies. In effecting these purposes the Price Administrator was authorized to establish maximum prices which would be generally fair and equitable and in doing so to give consideration to the prices prevailing between October 1 and October 15, 1941. Special limitations were imposed on the Administrator's powers over agricultural commodities. Maximum prices could not be established for an agricultural commodity until the price of the commodity had reached the highest of the following prices: (1) 110 percent of parity or a comparable price; (2) the market price as of October 1, 1941; (3) the market price as of December 15, 1941; and (4) the average price for such commodity during the period July 1, 1919, to June 30, 1929.26 As mentioned previously, approval of the Secretary of Agriculture was a prerequisite to the fixing of any price for an agricultural commodity. The Price Control Act also authorized the Price Administrator to establish maximum rents for housing accommodations in areas where defense activities had affected rent levels. Under this provision the following procedure was established by OPA: (1) the agency designated war-boom communities as defense rental areas and specified the levels at which rents should be stabilized; (2) a 60-day waiting period followed this designation, during which the recommended stabilization might be achieved by voluntary action of landlords or by State or local regulation; (3) if rents were not stabilized within 60 days, Federal regulation was extended to the area and OPA designated a maximum rent date which was "generally fair and equitable" and which gave due consideration to rents prevailing on April 1, 1941, or April 1, 1940, if defense activities had inflated rents prior to April 1941; (4) within approximately 60 days after designation of the maximum rent date all rental units in a defense rental area were registered with OPA; and (5) the registered rent became the legal maximum rent for the duration of the war unless an increase was approved by OPA. would forfeit for as long as 1 year his right to deal in the regulated commodity. (4) Finally, any consumer who had been charged more than the amount allowed by a price or rent regulation might sue the seller for treble damages--three times the amount of the overcharge of $50, whichever was higher. These provisions of the Price Control Act gave OPA an unusual assortment of enforcement tools. But as its area of control widened, the effectiveness of control depended upon the willingness of retailers, landlords, consumers, and tenants to comply voluntarily with price and regulations rather than upon formal enforcement action. Special provisions were included for the protection of private rights of individuals. Any person subject to a price or rent regulation could file with the Price Administrator a protest, accompanied by evidence supporting his contention that the regulation was unfair as applied to him. Within a reasonable period of time (generally 30 days) the Price Administrator was required to act on the protest and if the protest was denied, the individual had the right of appeal to an Emergency Court of Appeals which was created by the act. This court consisted of three judges appointed by the Chief Justice of the Supreme Court from Federal district and circuit courts and thus was certain to be highly competent. The Emergency Court of Appeals had exclusive jurisdiction, subject ot final review by the Supreme Court, to determine the validity of OPA price and rent regulations. This provision expedited judicial review of OPA administrative acts, permitted continuous operation of regulations pending review by the Emergency Court, and safeguarded individual rights as fully as was consistent with wartime conditions. Subsequent dissatisfaction with this procedure was caused by OPA's inability to review quickly the protests which poured in regularly. the procedure itself was fundamentally sound. Although the Price Control Act on the whole was satisfactory, the Government still lacked authority and a program to hold down the cost of living. The chief weakness in the price-control area was the limitation which had been imposed on the pricing of agricultural commodities. But there were as yet no supplementary controls over wages and little had been done to relate war finance to the requirements of the economic stabilization program. A series of crises showed that action on these matters could not long be delayed. prices go much above parity, danger is ahead." He stated that he was giving the legislation his approval with the understanding, "confirmed by Congressional leaders," that the bill contained nothing which could be construed "as a limitation on the existing powers of government agencies . . . to make sales of agricultural commodities in the normal conduct of their operations." The Government owned large stocks of grain and cotton which had been acquired in its attempts to maintain farm prices during periods of surpluses. By timely disposition of these supplies it would be possible both to relieve shortages and to restrain shortage-induced price increases. Soon after the President signed the Price Control Act, Secretary of Agriculture Wickard announced that the Government would undertake such a program. Under the plan, the Department would attempt to stabilize farm-produce prices which had not yet reached 110 percent of parity or the other levels stipulated in the Price Control Act and which, therefore, could not be controlled by OPA price ceilings. The policy on the disposition of surpluses was calculated to prevent increases in the price of food. Corn and wheat producers were receiving parity income as the result of Government benefit payments. If feed prices were allowed to rise, milk prices also would have to be increased. Higher feed costs would mean either price increases for poultry and hog producers or the abandonment of increased production programs for these basic foodstuffs. By careful disposition of surplus stocks, a $1 billion rise in the annual cost of living could be prevented, the Secretary of Agriculture believed. each from labor, management, and the public, with the function of deciding labor disputes which could not be settled by other methods. The WLB order did not contain any statement of national wage policy to guide settlement of wage disagreements. The Board, like other departments of the Federal Government dealing with wage matters, was directed by the Price Control Act "to work toward a stabilization of prices, fair and equitable wages, and cost of production." In the absence of policy standards such as those set forth in the Price Control Act with respect to price levels, the threat of further increase in the cost of living accentuated the administrative difficulties of the War Labor Board. Cases began to pile up before the Board had established an organization to handle them. Workers became impatient at the delays which seemed more exasperating as the cost of living surged upward. Wildcat strikes broke out, contrary to the no-strike pledge and beyond the control of the leaders who had given the pledge. The President instructed the Director of the Bureau of the Budget on March 16, 1942, to take the lead in developing an integrated anti-inflation program. the Treasury, Office of Price Administration, Federal Reserve Board, Department of Agriculture, and the Bureau of the Budget were to cooperate in formulating the program. the President appointed a committee, with the Vice President as chairman, which in accordance with the President's instruction, began to "work fast." businessmen, wage earners, and farmers can make up for taxes by increasing their incomes. Only simultaneous action on all fronts can stop the inflationary spiral. The essential steps proposed were to freeze prices as of April 1; to freeze all basic wage and salary rates, except those below 40 cents an hour; to request Congress to levy heavier taxes, including, in addition to the $7 billion program of the budget message, $2 billion of personal income taxes to be withheld by employers, and a retail sales tax to raise $2.5 billion; to seek early congressional consideration of the proposed $2 billion expansion of the Social Security programs; to request immediate repeal of the 110 percent of parity provision of the Price Control Act, and subsequently to freeze all farm prices; and to adopt other inflation controls, such as extension of rationing, control of inventory accumulations, and limitation of installment buying of non-rationed goods. Any substantial changes in this [tax] program proposed by the Administration, would greatly confuse the situation, delay enactment, and on these accounts, materially increase during the interval inflationary tendencies. There is little or no prospect of increasing the tax yield beyond the amount asked for in the Treasury program. A compulsory savings policy would, the Treasury believed, destroy its voluntary savings program. Arrangements had been made with labor and management for pay-roll deduction purchases of bonds and there was a large investment of personnel, planning, and advertising materials in the voluntary program. Chart 29. Sources of Federal Funds: Tax Receipts and Borrowings. excess purchasing power by a compulsory "universal savings plan," lowering of personal income-tax exemptions, and the expansion of the Social Security program. In conclusion, the memorandum stated, "Only a program as drastic and broad as that here outlined can stop inflation. Any lesser program must fail. Such failure will be a major defeat." The pessimistic tone of the memorandum was justified by economic developments since the declaration of war. From December 1941 to march 1942 food costs rose 4.9 percent and clothing prices 7.7 percent. By March the prices of these commodities were approximately 20 percent higher than 1 year earlier. These increases had taken place in spite of the extension of formal price controls by the Office of Price Administration, and they were greater than during any similar Period of the previous year. The rapid movement of workers to war production jobs during February and March contributed to the rising level of income payments. While the production of consumer goods declined sharply, retail sales continued at high levels (chart 30). Most of the ingredients for a run-away inflation were present.
. . . tax heavily, and in that process keep personal and corporate profits at a reasonable rate, the word "reasonable" being defined at a low level.
. . . fix ceilings on the prices which consumers, retailers, wholesalers, and manufacturers pay for the things they buy; and ceilings on rents for dwellings in all areas affect by war industries.
. . . stabilize the remuneration received by individual for their work.
. . . stabilize the prices received by growers for the products of their lands.
. . . we must encourage all citizens to contribute to the cost of winning this war by purchasing war bonds with their earnings instead of using these earnings to buy articles which are not essential.
. . . we must ration all essential commodities of which there is a scarcity, so that they may be distributed fairly among consumers and not merely in accordance with financial ability to pay high prices for them. 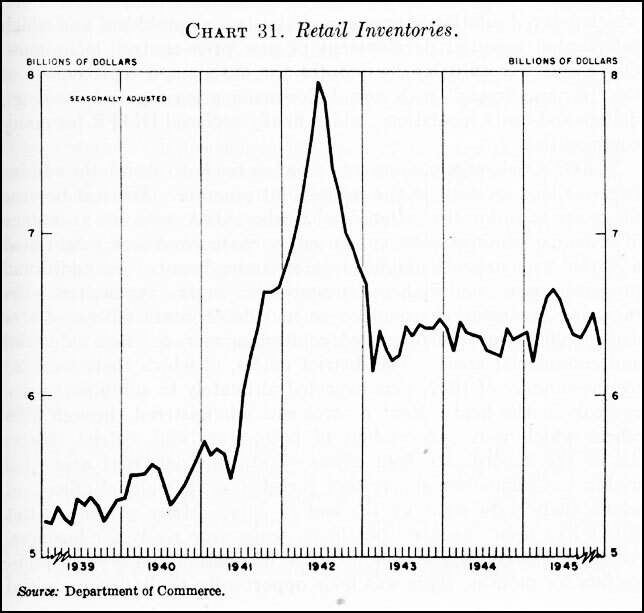 general price ceilings, control rents, and ration scarce commodities. The tax program and revision of farm price controls depended upon Congressional action which the President requested. Either Congress or the Executive might stabilize wages, the other crucial part of the anti-inflation program. The first and major action under the seven-point program was taken by OPA. On April 28, it issued the General Maximum Price Regulation which set the highest price charged in March 1942 as a ceiling over virtually every commodity purchased by the ordinary consumer. The GMPR was supplemented by 18 price regulations issued the same day and covering specific commodities such as solid fuels, non-ferrous castings, paper and paper products, farm equipment, and construction and road maintenance equipment. An order designating 302 defense rental areas also was issued, bringing to 323 the areas designated since passage of the Price Control Act. understand. Second, the agency lacked experienced administrative talent at the center. Price Administrator Henderson necessarily was preoccupied with high policy questions and with relations with Congress, other agencies, and the public. Thus the job of pulling together the price, rent, rationing, legal, and information departments and of providing administrative leadership for the whole organization fell to the senior deputy. The internal organization of OPA thus accentuated difficulties which the top personnel were not equipped to handle. Third, OPA programs called for the printing and distribution of vast quantities of regulations, registration forms, coupon books, and information bulletins. The agency was handicapped in this vital area by the weaknesses of the Government's facilities for handling printing and distribution jobs of such vast proportions. Administration of the General Maximum Price Regulation and other price regulations required processing of hundreds of price adjustment petitions alleging hardship. The national office lacked facilities to assemble and analyze data relevant to these cases and no general policies had been laid down to guide the personnel in granting adjustments. As a result, the national office during the summer of 1942 found itself swamped with work which it was not equipped to handle, which delayed solution of pressing administrative problems, and which interrupted essential development of new price-control techniques. One result was to delay for months the anticipated replacement of the "general freeze" with new tailor-made price regulations; e.g., dollars-and-cents regulations, which finally replaced GMPR for many commodities. provision with field staff (indeed, there were few with whom it might have been discussed) or to provide field offices with information useful in answering public inquiries. Provision for supervision of the field organization added to the confusion engendered by the loosely constructed organization. Until March 1942 responsibility for field operations was lodged in a Division of Field Operations through which all instructions, regulations, procedures, and the like were channeled to field offices. After the Division was abolished in March, the major program divisions communicated directly with price, rent, and rationing personnel in the field offices, frequently without informing regional administrators and state and district directors of their actions. Responsibility for supervision of the field organization was undertaken by the Senior Deputy Administrator who also was responsible for general management of the Washington office. These combined responsibilities were so burdensome that inadequate attention was given to administrative problems at both the Washington and field office levels. Although OPA's administrative inadequacies were to be expected in a new and rapidly expanding organization and were also present in other war agencies, they were especially significant in OPA because that agency had to cary the major responsibility for economic stabilization. As long as OPA's administrative deficiencies remained, price control rested on the ability of the Price Administrator to achieve compliance by securing the cooperation of business and the general public. The President's indication in his April 27 message that rationing would be resorted to only when there was an inadequate supply of an essential commodity represented an important policy decision. The Secretary of Treasury, in his argument against a stiff, integrated anti-inflation program, had urged the use of rationing on a wide scale in order to reduce competition between consumers for scarce goods. Limited experience with rationing had shown that, in view of administrative complexities and public resistance to any rationing not clearly justified by shortages, rationing should be used only in limited and urgent cases. $70 billion and the revenues from existing taxes about $18.3 billion. These estimates had led the Wallace anti-inflation committee, appointed by the President in March, to recommend new taxes totaling $11.6 billion and a $2 billion increase in social security taxes. Under this program we would have paid about 42 percent of war costs out of current revenues and about 58 percent by borrowing. The second reason for taxing heavily was that OPA price, rent, and rationing controls needed to be reinforced by a tax program which would reduce substantially excess consumer purchasing power. If a large share of the war were financed out of current income, there would be less competition between consumers for scarce goods such as food and clothing. Of course, we recognize that a tax on consumption would add to the cost of goods. But this in itself cannot bring about inflation. If you will pardon the language, we need only some plain old-fashioned American guts to stop inflation before it really gets under way. We can do this by putting a ceiling--at whatever point this ceiling may be--on the prices of agricultural products, manufactured goods, labor, commodities, and rents . . .
We cannot believe that the millions of patriotic American farmers and working men object to these proper means of controlling inflation, and it is our sincere belief that they are ready to join manufacturers in the acceptance of any rigorous controls which threats of inflation may require. The Treasury proposed to finance about 63 percent of the war by expanding its voluntary bond purchase program. At the request of Secretary Morgenthau, officials of the General Motors Corporation, and union representatives of General Motors' employees appeared before the committee and described the elaborate campaign which had been developed for the sale of war bonds. Union officials testified to their belief in the advantages of the voluntary system and the relation between voluntary methods, morale, and production. At the conclusion of the presentation the chairmen of the House and Senate committees gave their support to the voluntary savings program, about which the President had said: "I prefer . . . to keep the voluntary plan in effect as long as possible." During the first 3 months of 1942 bond sales to individual totaled only $2.3 billion, and for the quarter ending September 30 only $2.47 billion. Savings bonds sales accounted for less than one-fifth of the amount borrowed during July-September. During the summer, while Congress deliberated on the tax bill, bond purchases did not relieve notably the pressure on price ceilings. The Revenue Act of 1942 became law in October and would provide, according to estimates, approximately $32.6 billion additional revenue in the fiscal year 1943.32 This increase was about half of the amount which the President had requested. The United States would pay about 26 percent of war expenditures by taxation, as compared with 53 percent in Great Britain and 55 percent in Canada. To absorb some of the excess purchasing power, the new act levied a "victory tax" of 5 percent on income in excess of $12 per week, to be withheld from the individual's pay check. The Office of Price Administration faced two difficulties in controlling food prices: First, commodities such as poultry, eggs, sheep and lambs, milk and milk products and wheat products, including flour, could not be brought under General Maximum Price Regulations because of the price Control ACt's restriction on pricing agricultural commodities. The cost of living could not be stabilized until the prices of these basic foods were brought under control and with this objective the President's seven-point message requested Congress to restore the "original and excellent" goal of parity for American farmers. stocks of canned fruits and vegetables, they found that ceiling prices of their supplies were higher than the retail price ceilings. For one retailer, for example, the retail sales price of asparagus was $1.75 per case, the wholesale price $2 per case. Farm prices and labor costs were up about 10 percent each and transportation costs were 5 percent higher than in the previous year. Such substantial increases could not be absorbed by canners, but if they were passed on to retailers, retail price ceilings would have to be raised. The problem of the "squeeze" reached the crisis stage in May and June when, with record crops in the field,s packers and distributors threatened to strike until their prices were raised. Chart 32. 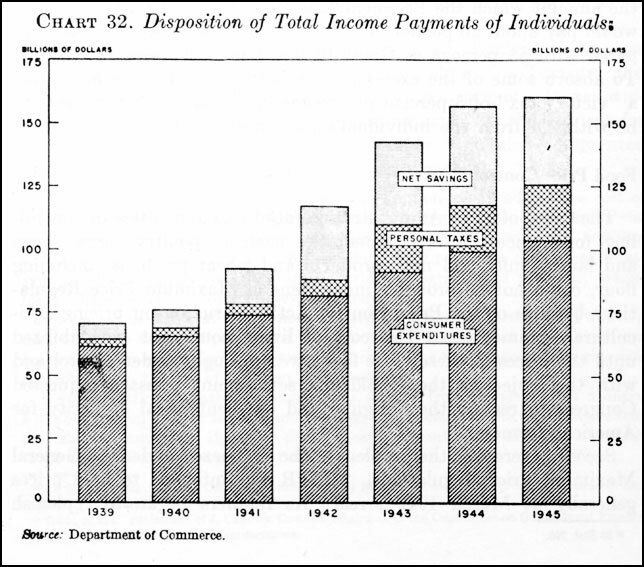 Disposition of Total Income Payments of Individuals. however, would have made more difficult the eventual stabilization of food costs. A third alternative was to hold the line at March price levels and to absorb increased costs through Government subsidies. Although OPA favored Government subsidies to relieve the "squeeze," this alternative also was questionable. In view of the legislative history of section 3 of the Price Control Act, which indicated a clear congressional intent to provide flexible prices for agricultural commodities, it was difficult to see how the Executive Branch could maintain fixed prices for agricultural commodities by subsidy payments. The authority of the Department of Agriculture in the maintenance of maximum prices was also a complicating factor. Through the Commodity Credit Corporation, the Department had about $450 million and unquestioned authority to subsidize for the purpose of increasing production or guaranteeing minimum prices to farmers. But use of these funds to maintain fixed food prices contrary to congressional policy might jeopardize the program for subsidizing food production. P:ending clarification of the policy of Congress on this question, I am asking you to use Commodity Credit Corporation funds, or funds available to the Department . . . for the purpose of making purchases for resale at a possible loss in those instances in which the situation is so critical that some sort of action needs to be taken in the very near future. You should also promptly advise congressional leaders of your plans in order top be assured that they have full understanding of the program and will facilitate legislation necessary for its success. I would like to have you work very closely with the Department of Agriculture on this program and render every possible assistance to the end that we maintain the highest possible production of food commodities while holding the cost of living at present levels. an amendment to the appropriation bill for the Office of Price Administration which restated and strengthened the 110 percent of parity and other restrictive provisions of section 3 of the Price Control Act.33 After conferences between congressional leaders, the Secretary of Agriculture and the Price Administrator, it was concluded that the available funds of the Department of Agriculture should not be used to maintain price ceilings until the specific question had been fully discussed by Congress. Accordingly, the Office of Price Administration made such adjustments in the price ceilings as were necessary to move 1942 crops of fruits and vegetables. A Gallup survey made in June showed that 58 percent of the farmers were satisfied with the prices which their crops were bringing. But Executive agencies were obliged to conform to legislative policy of flexible prices for agricultural commodities. This statement did not provide a national wage policy. When were there inequalities? Does an inequality exist when there are differences between one wage group and another? If so, it would be impossible to prevent an inflationary spiral. activities was to increase production by developing a stable labor force, reducing turnover and migration, and facilitating the training of new employees for industrial work. A secondary objective was to stabilize wages at levels which would help check inflationary pressures. A conference of the airframe industry held on the West coast in July illustrated the conflicting objectives among the several Government agencies interested in wage stabilization. THe War Manpower Commission was primarily interested in questions of labor supply, the War Production Board in the expansion of production. "Price as usual" during a production crisis was as reprehensible as "business as usual." This attitude was repugnant to OPA's position and could not be fitted into the general economic stabilization program. Divergent views of Government officials confused labor and employer representatives, who requested a statement clarifying the Government's standards of wage stabilization as set forth in the April 27 anti-inflation message. Since the union official shad presented requests for substantial wage increases, the effect of this statement was such that the conference adjourned and the Government representatives returned to Washington to work out a method of relating high-level production, price ceilings, and wage stabilization. survey, this formula was acceptable to a majority of workers: 60 percent of the workers were in favor of stabilizing wages at current levels. Of these, 37 percent insisted that the cost of living be kept in line with wages. The Office of Price Administration was less enthusiastic about the War Labor Board's formula for tying wages to the cost of living. Such a scheme would tend to maintain prewar standards of living--an expectation which was perhaps not justifiable in a war for survival. Under the formula, large blocks of workers would be entitled to wage adjustments. Such adjustments would complicate the task of the price-control agency in two ways; (1) unit labor costs, which had risen by an average of 1.3 percent per month from January to May, might force revisions of price ceilings which the agency was not equipped to handle; and (2) without compulsory savings or a stiff tax law, the gap between consumer income and the supply of consumer goods would steadily widen. On May 6, 1942, the Board of Governors of the Federal Reserve System revised and strengthened its Regulation W which restricted purchases of consumers' durable goods through installment payments, charge accounts, and other forms of credit. The regulation had been issued in August 1941 under authority of an Executive order, and was intended to slow down the record buying which threatened to deplete inventories of consumers' goods.36 Although credit controls were reasonably effective, they did not reach the people who could afford to pay cash for the goods they wanted. For this reason credit controls were of minor importance in the fight against inflation. savings, accounted for a small part of total Government borrowing. As long as the 110 percent restriction remained, OPA could not place ceilings on basic foodstuffs and the cost of living would continue to rise. Meanwhile, labor would drive for wage increases at least equal to those allowable under the Little Steel formula. With the break-down of the seven-point program, another drive for coordination of anti-inflation activities was begun. By the end of July it was apparent that the Little Steel formula for granting wage increases was an invitation to some of the farm organization leaders to get still higher prices for farm produce. Labor leaders considered any substantial rise in the cost of living as an invitation to seek further wage increases. Congress was anxious to get out of Washington. The normal midsummer recess seemed even more appealing in view of the November Congressional elections. By the end of July, many Congressmen had gone home during an unofficial recess to which the President had agreed. OPA began to push for action by the Executive branch to ease the stabilization crisis and present to Judge Rosenman a proposal at the White House for tightening up farm price and wage controls. The memorandum stated that the cost of living could not be stabilized "unless all major elements . . . including wages and agricultural commodities, are subject to common stabilization." It recommended establishment of an administrative board to formulate wage stabilization policies and to issue directives to Federal agencies responsible for wage regulation, and the use of subsidies to maintain OPA price ceilings. The proposal was rejected because, without legislation authorizing such use of subsidies, the rise in the cost of living could not be halted. Also, creation of another labor agency was administratively unjustifiable and would probably contribute to rather than minimize labor unrest. The desirability of creating an agency to coordinate actions of various agencies responsible for parts of the stabilization program was explored. Such an agency would be useful only if authority could be found to stop the rise in the cost of living. After discussions among White House and Bureau of the Budget staff, a draft order was prepared in August, creating an Office of Economic Stabilization; prohibiting wage increases except where necessary to necessary to eliminate substandards of living or inequalities or to restore real wage rates as they existed on January 1, 1944 [sic: 1941 or 1942?] and authorizing the Administrator of OES to fix agricultural prices at the higher of two levels--market price or parity price as computed by the Secretary of Agriculture. Remember that the Second War Powers Act was passed in march 1942, a little over a month after the price-control bill was passed, and, therefore, it supersedes the Price Control Act as to any matters with respect to which the two may conflict. That whenever the President is satisfied that the fulfillments of requirements for the defense of the United States will result in a shortage in the supply of any material . . . he may allot such material in such manner . . . upon such conditions . . .
What can that mean other than the conditions of price, terms, and so forth by which the materials and supplies will reach the public for private account, will reach the Army, and will reach the lend-lease operations? the November congressional elections. Presidential advisers, confident of the willingness of the public to accept more drastic economic sacrifice and perturbed by the seriousness of the stabilization crisis, urged the President to issue the proposed order. Their recommendation was rejected by the President and on September 7, he asked Congress for an immediate revision of the price Control Act. On the question of the use of Executive authority to obtain control of farm prices, he said "the course which I am following in this case is consistent with my sense of responsibility as President in time of war, and with my deep and unalterable devotion to the processes of democracy." Again he pointed out that real stabilization could be achieved only by concerted action on all seven of the anti-inflation fronts. As in April, such action depended upon enactment of an adequate tax program, and a law permitting the fixing of price ceilings on farm products at parity prices. The President called attention to the fact that Congress had not acted on this essential legislation and that further delay would endanger the economy. He said that the Price Control Act restrictions on the pricing of farm commodities meant that "the lowest average level for all farm commodities at which ceilings may be imposed is not 110 percent, but 116 percent of parity." Since price ceilings were established in May] 1942, food costs--controlled and uncontrolled-had risen 11/4 percent per month; exempt commodities had risen and average of 31/2 percent per month since May. The rise in uncontrolled food prices, he said, "has been so drastic as to constitute an immediate threat to the whole price structure, to the entire cost of living, and to any attempt to] stabilize wages." Wages could not be stabilized unless the cost of food and clothing and shelter was also stabilized. I ask the Congress to take this action by the first of October. Inaction on your part by that date will leave me with an inescapable responsibility to the people of this country to see to it that the war effort is no longer imperiled by threat of economic chaos. In the event that the Congress should fail to act, and act adequately, I shall accept the responsibility, and I will act. Within a short time, Congressmen were on their way back to Washington and by September 21, bills had bene introduced, hearings had been held, and measures had been reported to the House and Senate. Debate began immediately. Minor issues were administration of the Price Control Act by the Office of Price Administration, failure of the Executive Branch to stabilize wages following the passage of the Price Control Act, the extent to which discretionary authority would be granted to "correct gross inequities," and the possibility of preventing inflation without establishing controls over all segments of the economy. The possibility of a drive to get higher prices also had been foreseen in the President's Labor Day message, in which he said, "In computing parity, we should continue to use the computations of the Bureau of Agricultural Economics made under the law as it stands today." Congress was deluged with telegrams and letters urging that the parity formula law be changed to include farm labor costs. The American Farm Bureau federation, National Grange, National Council of Farmer Cooperatives, and the National Cooperative Milk Producers Federation all supported revision.44 These pressures were so intense that the chairman of the Senate Banking and Currency Committee felt that it was necessary to remind his colleagues that "we do not hear from the vast majority of the American people. "45 Protests of Senators against pressure tactics provoked the response that leaders of farm organizations "are elected by farmer members of their organizations" and express the convictions and recommendations of millions of farmers.46 Farm labor shortages, rising labor costs incident thereto, and the Government's program for increased food production were cited in support of the proposed revision. boost to the inflationary spiral. A Presidential veto and issuance of the September draft Executive order seemed probable. In the Senate supporters of the anti-inflation program noted the possibility of a veto and devised a compromise which would permit the revision of price ceilings by the President to cover the increased production costs. Farm-organization leaders opposed the compromise, arguing that there was nothing in the record of price control to indicate that the Presidential authority would be used to make such revisions. The compromise was accepted, however, and the Stabilization Act was sent to the White House on October 2. The act provided that price ceilings for agricultural commodities could not be set below the higher of two prices: (1) parity or comparable prices as determined and adjusted by the Secretary of Agriculture; and (2) the highest price received by producers between January 1, 1942, and September 15, 1942. The act required that prices fixed for processed commodities should reflect to the grower the higher of these two prices and allow a generally fair and equitable margin for the processor. The compromise on the addition of farm labor costs to parity required that they should be given "adequate weighting' in fixing maximum prices for agricultural commodities and that these prices be adjusted where "it appears that such modification is necessary to increase the production of such commodity for war purposes, or where by reason of increased labor or other costs to the producers . . . incurred since January 1, 1941, the maximum prices . . . will not reflect such increased costs." Other sections dealt with the prevention of a postwar collapse of agricultural prices and increased the crop-loan rate from 85 to 90 percent of parity. The act fixed the highest wage levels existing between January 1, 1942, and September 15, 1942 (the same base period as that required for farm prices) as a floor below which wage and salary ceilings could not be set except where adjustments in wages and salaries were necessary to correct gross inequities and to aid in the prosecution of the war. Also, a basis for control of common-carrier and utility rates was established in the act. living. The new legislation removes the exemption of certain foods, agricultural commodities, and related products from the price control of the Emergency Price Control Act. . . . It leaves the parity principle unimpaired. It reaffirms the powers of the executive over wages and salaries. It establishes a floor for wages and for farm prices. Following through on the directive of Congress to issue a general stabilization order before November 1, the President on October 3 signed an Executive order establishing the Office of Economic Stabilization, headed by the Economic Stabilization Director.51 An Economic Stabilization Board was set up to advise and consult with the Director, It comprised the Secretaries of Treasury, Agriculture, Commerce, and Labor, the Chairman of the Board of Governors of the Federal Reserve System, the Director of the Budget, and Price Administrator, the Chairman of the War Labor Board, and two representatives each of labor, management, and agriculture, appointed by the President. The October Executive order established the following administrative pattern for management of the stabilization program: The Director of OES, on behalf and with the support of the President, would formulate general programs and reconcile conflicting policies and disagreements among agencies whose actions affected economic stabilization. These agencies, such as WLB, OPA, and Agriculture, would retain primary responsibility within their jurisdiction, but would be subject to policy directives of OES. Under this pattern OES would not need a large staff, but as stated by the order, would "so far as possible, utilize the information, data, and staff services of other Federal Departments and agencies which have activities or functions related to national economic policy." Justice Byrnes resigned from the Supreme Court in order to take the post of Economic Stabilization Director. In announcing his appointment on October 3, the President characterized the job of the Director as "one of the most important in the country," and as calling "primarily for judicial consideration." The organization of the Office "will therefore be small because the administrative action will be carried out by the existing agencies." Stabilization was instructed to develop "a comprehensive national economic policy relating to control of civilian purchasing power, prices, rents, wages, profits, rationing, subsidies, and all related matters." The National War Labor Board was designated as the agency to carry out the wage policy of the order, which was to prevent "any increase in the wage rate prevailing on September 15, 1942, unless such increase is necessary to correct maladjustments or inequalities, to eliminate substandards of living, to correct gross inequities, or to aid in the effective prosecution of the war." Any wage increase which might require a change in an OPA price ceiling would have to be approved by the Director of OES as well as by the War Labor Board. Notice of all proposed increases in wage rates were to be filed with WLB. The Secretary of Agriculture and the Price Administrator were made jointly responsible for control of agricultural commodity prices and were directed to stabilize them "so far as practicable, on the basis of levels which existed on September 15, 1942, and in compliance with the act of October 2, 1942." Disagreements between the Secretary and the Price Administrator were to be resolved by the Director of OES. The DIrector was authorized "to take necessary action, and to issue the appropriate regulations, so that, insofar as practicable, no salary shall be authorized to the extent that it exceeds $25,000 after the payment of taxes." The purpose of limiting salaries was "to correct gross inequities and to provide for greater equality in contributing to the war effort." Action taken by OES under this provision subsequently was reversed by Congress. The order also instructed the Price Administrator to "determine price ceilings in such a manner that profits are prevented which in his judgment are unreasonable or exhorbitant." This provision likewise was criticized by Congress and industry which from time to time questioned whether OPA was using its powers to reform business and eliminate free enterprise under the guise of necessary wartime regulations. to reduce current rents, I am sure you will proceed to take such action as may be necessary. . . . This Government is determined," the Chief Executive said, "to use all of its power to prevent any avoidable rise in the cost of living." In this manner the Government developed its stabilization program and established the administrative arrangements required to carry it into effect. We were to rely on price, rent, and wage controls as principal stabilization tools and on borrowing rather than taxation to finance the war. Failure to tax heavily would handicap operation of price and wage controls and, in months to come, produce other inflation crises. Failure to establish effective controls over wages would endanger the entire stabilization effort. In tackling these problems the Government was anxious that the social and economic gains of the preceding decade be retained as nearly intact as possible and in this design it was supported by determined and vigorous leaders of labor and farm organizations. These reforms were not established so firmly that there were not some who hoped to eliminate them. As large incomes enabled many families for the first time to obtain an adequate diet, and as we undertook to supply large quantities of food and clothing to our Allies, agriculture found the prosperity which it had sought during the hears following the Great Depression. Leaders of labor and farm groups attempted, during 1942, to advance and consolidate the immediate economic interests of their constituents. Throughout this period farmers and laborers appeared to see more clearly and more quickly than their leaders the social and economic adjustments required by total war. The ordinary consumer--the white-collar worker, the Government clerk, the pensioner--who would suffer most by an uncontrolled rise in the cost of living, was so ineffectively represented in Congress that his interests actually were neglected. The byplay of these pressures before and after the enactment of the Price Control Act demonstrated clearly the necessity for skilled political management in achieving economic stabilization. 1. United States Congress, house. Committee on Banking ad Currency. Hearings (revised) on H.R. 5479, 77th Cong., 1st sess., p. 186. Leon Henderson. 2. U.S. Congress. Senate. Committee on Banking and Currency. Hearings on H.R. 5990, 77th Cong., 1st sess., p. 16. 3. House Document No. 332, 77th Cong., 1st sess. 4. U.S. Congress. House. Committee on Banking and Currency. Hearings (revised) on H.R. 5479, 77th Cong., 1st sess. p. 1553. 5. U.S. Congress, Senate. Committee on Banking and Currency. Hearings on H.R. 5990, 77th Cong., 1st sess., p. 165. 6. Congressional Record, vol. 87, pt. 9, p. 9207. 7. New York Times, Feb. 5, 1942, p. 20, cols. 2 and 6. Senator Prentiss M. Brown in a letter to the editor. 8. U.S. Congress. Senate. Committee on Banking and Currency. Hearings on H.R. 5990, 77th Cong., 1st sess., p. 140. 9. U.S. Congress. House. Committee on Banking and Currency. Hearings (revised) on H.R. 5479, 77th Cong., 1st sess., p. 1112. 10. Ibid., p. 1389. The date of the resolution was Sept. 10, 1941. 12. U.S. Congress. Senate. Committee on Banking and Currency. Hearings on H.R. 5990, 77th Cong., 1st sess., p. 421. 14. Public Opinion Quarterly, vol. 5, No. 4, p. 667. 15. For the Farm Bureau's position following the declaration of war, see testimony of O'Neal in Senate Committee on Banking and Currency Hearings, p. 429. Secretary Wickard's statement before the House Committee (see House Committee on Banking and Currency Hearings, pp. 20, 71, et seq.) was made a part of the Senate Committee record by O'Neal. 16. Price Schedule No. 53, 6 Federal Register 6409. 17. U.S. Congress. Senate. Committee on Banking and Currency. Hearings on H.R. 5990, 77th Cong., 1st sess., p. 443. 18. Congressional Record, Vol. 87, pt. 9, p. 9900. For price data, see U.S. Department of Labor, Wartime Prices, part I, p. 57. 19. Congressional Record, vol. 87, pt. 9, p. 9001. 20. Department of Agriculture. Press Release. Statement of Claude R. Wickard, Secretary of Agriculture, before the Senate Banking Committee and Currency Subcommittee on H.R. 5990, Jan. 2, 1942. 21. Congressional Record, vol. 88, pt. 1, p. 7. One of several amendments introduced by Senator Bankhead on Jan. 5, 1942. 22. Senator Prentiss M. Brown, Congressional Record, vol. 88, pt. 1, p. 175. 23. Congressional record, vol. 88, pt. 1, p. 179. 26. 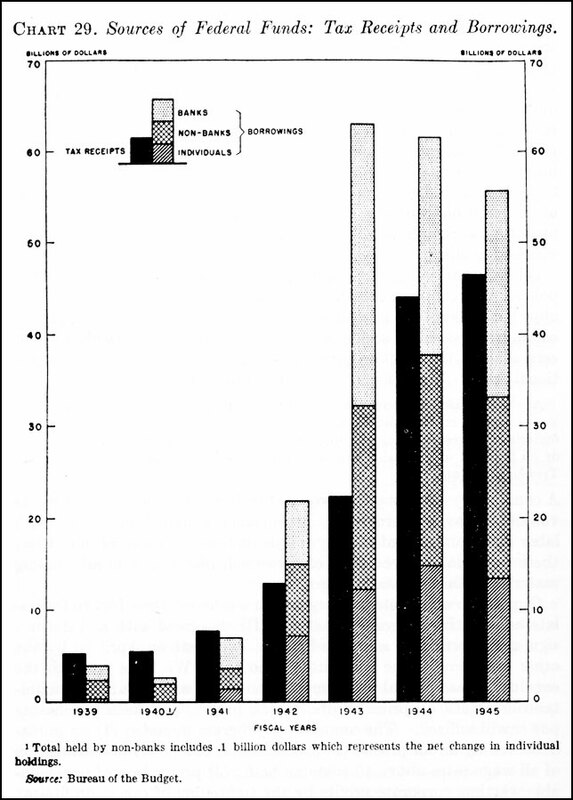 The explanation of why these alternative ceilings were written into the law in the following: (1) 110 percent of parity gave the most favorable price for wheat, corn, oats, barley, sweet potatoes, soybeans, peanuts, flaxseed; (2) October 1, 1941, was most favorable for cottonseed and certain types of tobacco; (3) December 15, prices were highest for rice, eggs, beef cattle, veal calves, and wool; and (4) the 1919-1929 average gave the highest price for potatoes, edible dry beans, cotton, live chickens, and lambs. 27. Congressional Record, vol. 88, pt. 1, p. 1188. The bill was S. 2255 and the report was Senate Report No. 1054; See New York Times, Feb. 1, 1942, p. 1, col. 1. 28. Congressional Record, vol. 88, pt. 1, p. 40. 29. House Document No. 716, 77th Cong., 2d sess., p. 3. 30. U.S. Congress. House. Committee on Ways and Means. Hearings on Revenue Revision of 1942 (revised), pp. 2 et seq. 31. Ibid., p. 274. Statement of Cheever Cowdin, Chairman of the Committee on Government Finance of the National Association of Manufacturers. 34. House Document No. 716, 77th Cong., 2d sess. 35. OPA Press Release 273, July 13, 1942. Statement of Richard V. Gilbert. 36. Executive Order No. 8843, Aug. 9, 1941, 6 Federal Register 4035-37; Regulation W, August 21, 1941, 6 Federal Register 4443, revised May 6, 1942, 7 Federal Register 3351-57. 37. Senator Prentiss M. Brown, Congressional Record, vol. 88, pt. 6, pp. 7407-09. 38. Public Opinion Quarterly, vol. 6, no. 4, p. 452. 39. New York Times, Sept. 2, 1942, p. 16, col. 3. 40. New York Times, Aug. 28, 1942, p. 1, col. 1, Senator Taft. 41. Congressional Record, vol. 88, pt. 5, p. 7042. 43. Congressional Record, vol. 87, pt. 9, pp. 9228-29. 44. Congressional Record, vol. 88, pt. 6, p. 7244. 46. New York Times, Sept. 26, 1942, p. 1, col. 4. Messrs, Goss, Teague, Babcock, O'Neal, and Holman to Senators Thomas (Oklahoma) and Hatch. 47. Senator Barkley, Congressional Record, vol. 88, pt. 6, p. 7246. 48. Congressional Record, vol. 88, pt. 6, p. 7251. This was not a vote on final passage of the bill. 50. White House Press Release, Oct. 3, 1942. 51. Executive Order No. 9250, Oct. 3, 1942. 7 Federal Register 7871.